I began writing in the late eighties. I was homeschooling three very active young boys and needed an outlet for all the joy. That’s my story, anyway. My first attempts at writing weren’t great. They were mostly western adventure romance stories. They remain safely tucked away in a drawer somewhere. Who knows, one day I may pull them out and get them in publishing form. A couple of the stories have stuck with me over the years, kind of like that special box some of us keep, filled with memorabilia. Somewhere along the way, Jael of Rogan came to life in my imagination. I blame the popular movie series, The Lord of the Rings. Why else would I dream of lords and ladies and handsome warriors on horseback? I pursued Jael, typing as fast as my fingers would go, heedless of grammar and spelling issues. Sheer joy! Then the work began. But I was unlearned (naive) regarding the art of writing novels. I self-published it, which isn’t naive, but I was nowhere near ready for such an undertaking. I had fans who loved the stories. So one day, I pulled them back out, put my updated skills to good use, then found someone to help me publish the two novels–Gregg and Hallee Bridgeman of Olivia Kimbrell Press™. They actually released them under their brand-new Sign of the Whale Books™ imprint. That was the beginning. A few months later, I was contacted by Tracy Ruckman of Write Integrity Press. 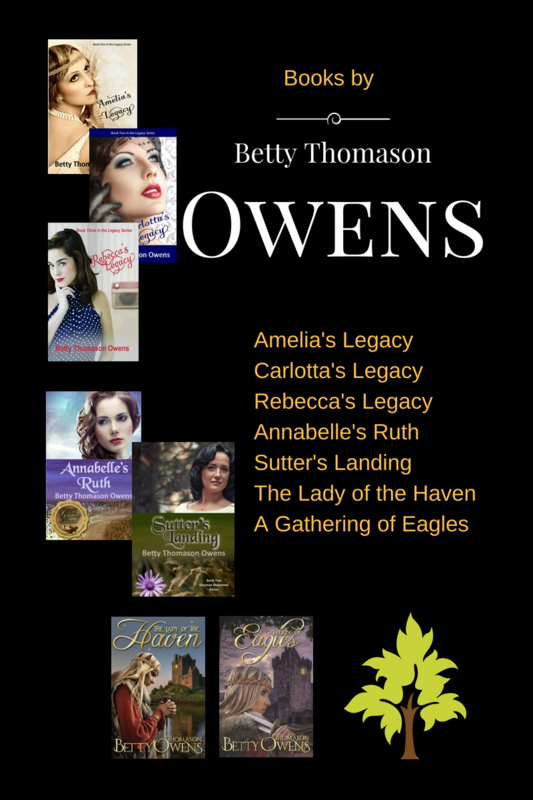 WIP published Amelia’s Legacy, book 1 of the Legacy Series, (October, 2014), book 2, Carlotta’s Legacy in 2016, and book 3, Rebecca’s Legacy in 2018. Write Integrity Press also published the award-winning Annabelle’s Ruth, book 1 of the Kinsman Redeemer series in June, 2015. This 1950s-era story is inspired by the Book of Ruth, and my mother’s early life. Book 2, Sutter’s Landing, released in 2017. I’m working on book 3 at present (2018).